The Fall 1975 issue of the Correction Officers' Benevolent Association's newsletter, edited by Donald Cranston (who would later become president of COBA and still later of the Correction Captains Association) devoted extensive coverage and commentary to the Motchan slaying. A sad and final tribute was paid to our brother Officer GEORGE MOTCHAN on September l9th . 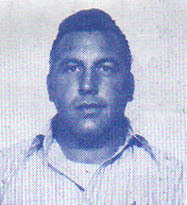 George was killed in the line of duty, at Kings County Hospital. 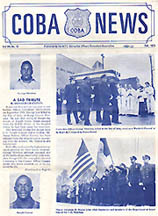 The Fall, 1975 issue of COBA News devoted this front page as well as columns on inside pages to the murder and funeral of C.O. Motchan. He was shot trying to thwart the escape of Joseph James. James escaped from the O.P.D. Clinic of the hospital where he had been taken for treatment. Also wounded during this escape were C.O. Joseph Connor and a civilian, Ms. Annie Nelson. Officer Connor has been released from the hospital and is recovering from his wounds. Ms. Nelson is still hospitalized. Both officers deserve the highest recognition possible for their heroic behavior. 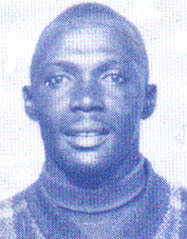 George Motchan, although unarmed and at the mercy of an armed killer, with complete disregard for his own safety, shouted a warning to Joe Connor. Officer Connor credits this brave unselfish act as having saved his life. 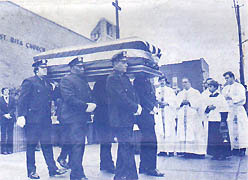 Correction Officer George Motchan, killed in the line of duty, receives a Warden's Funeral at St. Rita's R.C. Church in Staten Island. The Department's Rules & Regulations 5.66 (3.30.010) states that Departmental recognition may be awarded to members of the Department for acts performed while on duty which involve gallantry, extraordinary bravery, grave personal danger or intelligent and valuable service demonstrating special faithfulness of perseverance. Joe Connor also acted in a heroic manner, although he had been shot by the fleeing convict, Joe maintained his composure and refrained from firing his weapon because such action would have endangered the twenty civilians who were in the clinic at the time. Many of those there for treatment were children. On September 9th, C.O. George Motchan and C.O. Joe Connors were shot at K.C.H.. Immediately after this tragedy, the Commissioner and the hospital administrator were interviewed on television. Both condemned the practice of bringing dangerous criminals into the public health facilities areas for treatment. The same conditions exist today at Kings County Hospital as existed the day George, Joe and Ms. Nelson were shot. Conditions and security procedures at Elmhurst Hospital are as bad if not worse than those at King County. Must we suffer another tragedy before these procedures are improved. 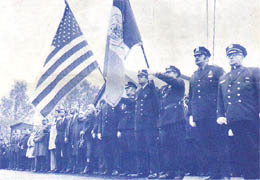 Mayor Abraham D. Beame joins other dignitaries and members of the Department at honor funeral for C.O. Motchan. On the day George Motchan was laid to rest, his accused killer, Joseph James, was arrested. This arrest was a direct result of the $10,000 reward offered by the COBA for information concerning Joseph James. EDITOR'S NOTE: We would like to thank Mr. Tufo for the concern he has shown for the conditions under which the Correction Officers must work. In particular, we thank him for the concern he displayed for Officers George Motchan and Joseph Connors. Mr. Tufo was among the first donors of blood for these wounded officers.